I think the difference between the old and new photos shown from this location is pretty fascinating. 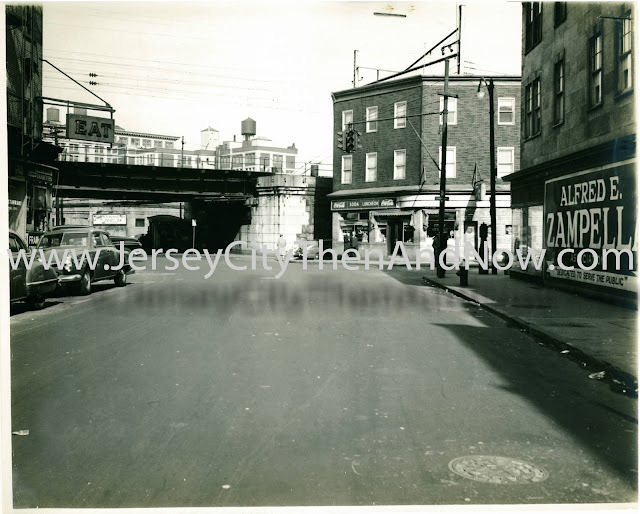 The photos were taken from Marin Blvd (previously known as Henderson St) looking north towards Columbus Avenue (previously known as Railroad Avenue). When I first moved to Jersey City I wondered why Columbus Avenue was so wide compared to other streets in the downtown area. It was only later that I found out that there used to be a railroad running along it. The street used to be called Railroad Avenue, and it got it's name from the elevated railroad that ran along it to the Pennsylvania Railroad Terminal at Exchange Place. Between Brunswick and Henderson the elevation was an iron trestle, but east and west of this there was an embankment with stone siding. This embankment is still (2013) standing west of Brunswick and the old photo shows the connection between the trestle and the embankment from Henderson running east to the waterfront. There are two buildings from the old picture that are still standing today : The A & P Warehouse behind the trestle to the left and another warehouse behind the iron trestle that has been converted to loft apartments. The latter still has an old water cistern on the roof but the building has been painted uniformly light beige. 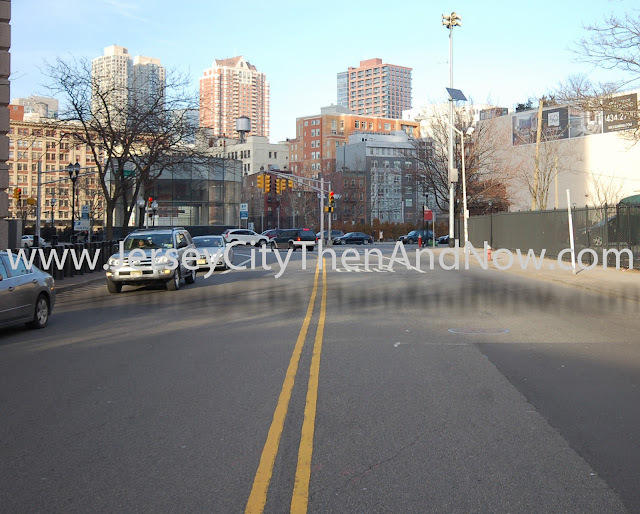 It's not well known amongst Jersey City's residents today, but Newark Avenue used to continue all the way east to Montgomery St, through the current location of the Metropolis Towers. In the old picture it's Newark Avenue that continues between the buildings to the right in the picture. In the fifties several blocks of old buildings (including the ones to the right in this photo) were demolished to make way to these new high rises. When looking closely at the old picture, you can see the eastern entrance to the Grove Street Path station under the iron trestle. 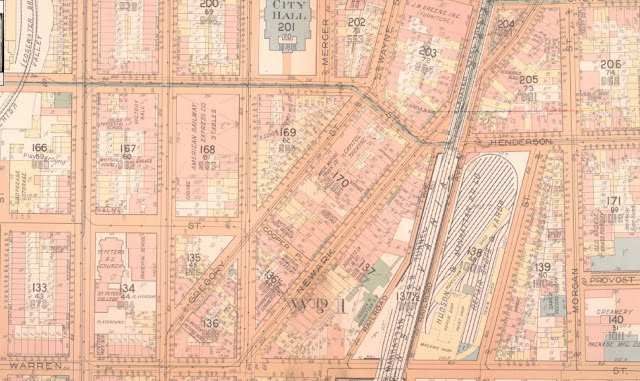 In the map below, the old street grid can be seen, before the demolitions in the fifties. The old photo was taken between the blocks with number 170 and 203 written on them in the map. Do you happen to have photos from the streets that were eliminated (Newark Ave, Gregory St and Coopers Place) in the fifties? Please send me an email, and with your permission I'd like to share them on this blog. Credits: Both photos are from my personal collection. The map is from Rutgers collections here.